For sale i have one rare action figure the S.T.A.R. from the film The Black Hole produced by Walt Disney in 1979 as their answer to the Star Wars phenomenon of that time.The S.T.A.R. is the 3rd (third)rarest action figure from the toy line that ensued .To date there are only a handfull of example made by Gig that has survived,i personnaly have been chasing this figure for 2 years before i got this one,this is also one of the very few known AFA recorded and graded examples ,from the Italian run and produce by Gig (Mego agent in Italy). if you are a collector you will know this is tough to get ,this is why this one as been graded to authentify the figure and give it an accurate description. The subgrades are as follows card 80,bubble 85 and figure 85 overall grade 80 y nm ,the cardback is unpunched! For sale i have one rare action figure the OLD BOB from the film The Black Hole produced by Walt Disney in 1979 as their answer to the Star Wars phenomenon of that time.The OLD BOB is the 2nd (second)rarest action figure from the toy line that ensued .To date there are only a handfull of example made by Gig that has survived,i personnaly have been chasing this figure for 3 years before i got this one,this is also one of the very few known AFA recorded and graded examples ,from the Italian run and produce by Gig (Mego agent in Italy). The subgrades are as follows card 80,bubble 85 and figure 90 overall grade 85 nm+ and encased in an achival case,the cardback is unpunched! payment by paypal from a registered user,no third parties! For sale i have a V.I.N.CENT from the film The Black Hole produced by Walt Disney in 1979 as their answer to the Star Wars phenomenon of that time.To date there are only a handfull of example made by Gig that has survived,this is also one of the very few known AFA recorded and graded examples ,from the Italian run and produce by Gig (Mego agent in Italy). if you are a collector you will know this is a popular figure to get and is scarce,this is why this one as been graded to authentify the figure and give it an accurate description. The subgrades are as follows card 80,bubble 85 and figure 90 overall grade 80 nm, in archival case ,the cardback is unpunched! Here is a vintage Mego Vin Cent Robot on the original car. The card has some stains, tears and is warped. The bubble is in very good condition with no cracks. Vin Cent has never been removed from the card. 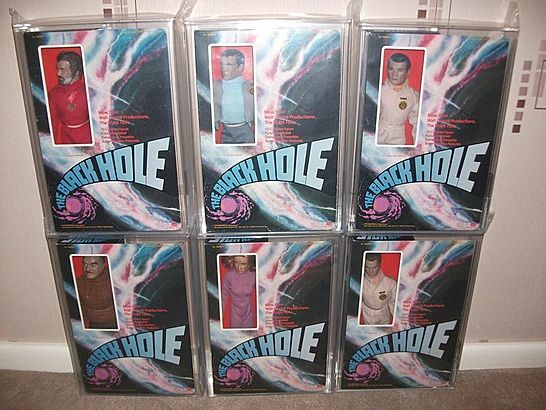 You are bidding on a loose nearly mint condition rare MEGO Black Hole S.T.A.R. action figure. The limbs are tight and comes with gun. 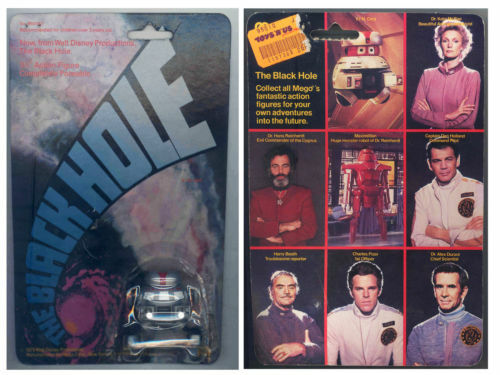 1979 Mego "The Black Hole" V.I.N. CENT figure. Still sealed. I have posted two high resolution photos to give you an idea of condition. This would be a great candidate to be graded. Maximillian - The Black Hole - Mego 7" Magnetic figure - Manufactured by Mego and distributed in Italy by GiG - Magnetic figure w/detachable & interchangeable limbs - 1979 - MIB (Mint In Box) Box C8 - box corners and edges have some color rubbing and shelf wear - contents mint and unused in original plastic baggie with cardboard inserts - scarce magnetic figure manufactured by Mego and distributed only in Europe by Gig - Disney Motion Picture- Please check our auctions and e-Bay store. We have thousands of 1970s to current Super Heroes , comic book , cartoon , TV , and movie related action figures and toys. We combine shipping when buying more than one item at once. V.I.N. 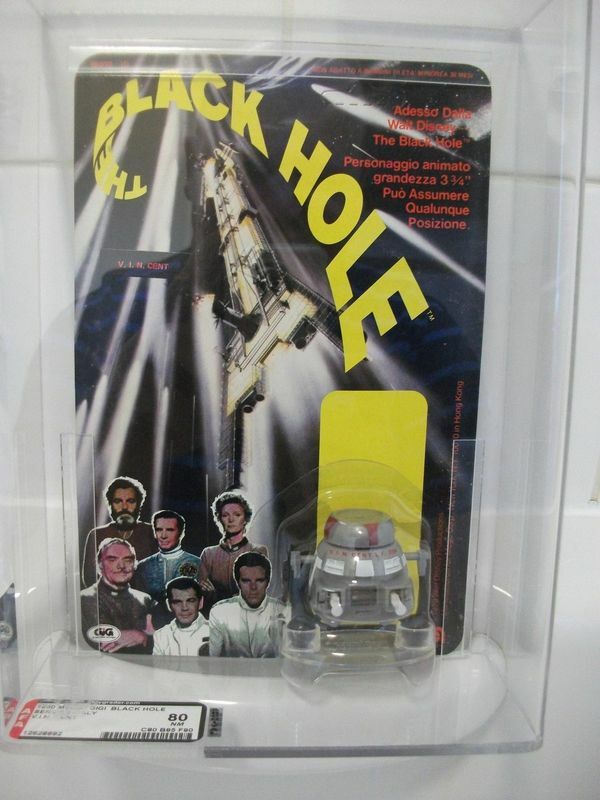 Cent - The Black Hole - Mego 7" Magnetic figure - Manufactured by Mego and distributed in Italy by GiG - Magnetic figure w/detachable & interchangeable limbs - 1979 - MIB (Mint In Box) Box C8/8+ - box has slight corner & edge wear rubs - crease on bottom box lid - contents mint with original plastic baggies and cardboard inserts - scarce magnetic figure manufactured by Mego and distributed only in Europe by Gig - Disney Motion Picture- Please check our auctions and e-Bay store. We have thousands of 1970s to current Super Heroes , comic book , cartoon , TV , and movie related action figures and toys. We combine shipping when buying more than one item at once. this is insanely rare the fans will know,get it before the new film go out and the values start climbing,i hopes it goes to a fellow fan, i will listen to reasonnable offers,i`m not in it for a profit,this is my personnal set. these is an amazing opportunity for any fans as this is almost impossible to find especially in this sort of condition,this is why i got it graded to verify and authentify so no cheap copies here. i will listen to offers as long as they are reasonnable.thanks. THIS IS IT! VERY RARE OLD B.O.B. 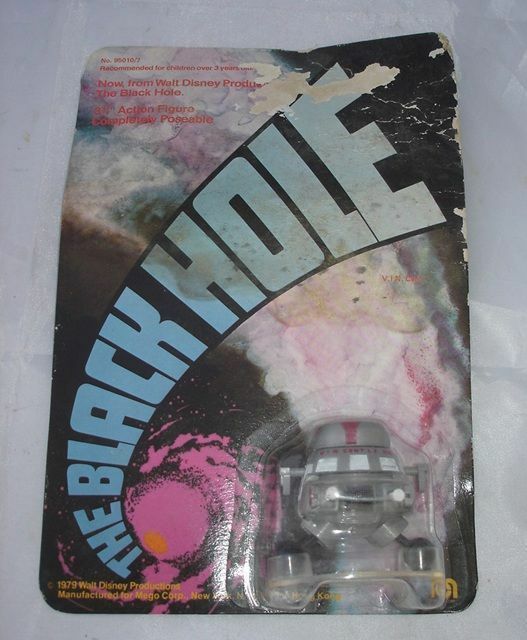 MEGO/GIG 1979 DISNEY THE BLACK HOLE ACTION FIGURE. RELEASED ONLY IN CANADA AND ITALY. THIS IS THE ORIGINAL AUTHENTIC ITEM. COMPLETE WITH BASE AND IN NEAR MINT PLUS CONDITION. THE PAINT IS PERFECT. THE STICKER IS PRESENT AND THE BASE IS INCLUDED. C9+ CONDITION. ASK ALL QUESTIONS PRIOR TO BIDDING OR BUYING. SALE IS FINAL. 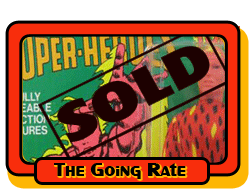 CHECK OUT MY OTHER AUCTIONS FOR ADDITIONAL MEGO BLACK HOLE ITEMS AND OTHER VINTAGE ACTION FIGURES. THANKS.